We provide research and extension services for people who work with nontimber forest products (NTFPs), including medicinal, edible and decorative plants and fungi. People have harvested roots, barks, foliage, fruits and mushrooms from forests for generations. Today these are meaningful traditions and sources of income for families and communities across the country. 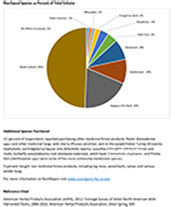 There is growing interest in cultivating NTFPs and managing forests to produce them, but there is a lack of reliable information about their markets. Our goal is to measure the scope and distribution of NTFP production and its economic impact, and make that research available to people who work with and care about these important species. This website is a place to learn about our work, see results and participate in this year’s confidential survey. You can also find other resources for stewarding, growing and managing lands for nontimber forest products.